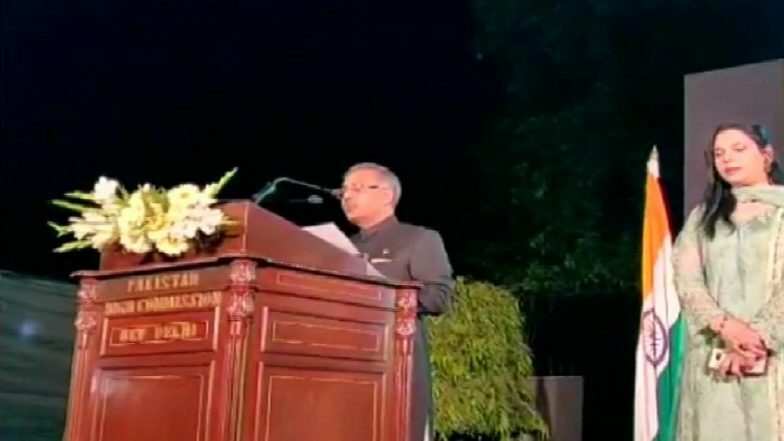 New Delhi, March 22: At the Pakistan National Day 2019 event organised at the Pakistan High Commission on Friday, the country's envoy to India, Sohail Mahmood called for reconciliation between the two neighbours. The resumption of dialogue, said Mahmood, is inevitable to resolve the pending differences between New Delhi and Islamabad. Mahmood, while addressing the gathering at the Pakistan Resolution Day programme, said only bilateral engagement could offer a constructive solution to the Kashmir dispute, along with other issues. India Won't Send Any Representatives For Pak Event: MEA. "Coercive measures haven't worked in past; they'll not work in future. Diplomacy and dialogue remain indispensable for enhancing mutual understanding, addressing mutual concerns and resolving long-standing disputes including J&K," he said. "A relationship based on sovereign equality, mutual respect and mutual interest is the best guarantee for a peaceful and prosperous future. We do hope the long winter in India-Pakistan relations would come to an early end," Mahmood added. The Pakistan High Commissioner's remarks comes days after Prime Minister Narendra Modi said his government would not relent against cracking down on terrorism. During a recent election rally, Modi said the Indian forces have been given a free hand to avenge the cross-border assaults. Reflecting the stern approach adopted by India following the February 14 Pulwama attack, the Ministry of External Affairs (MEA) decided to boycott the Pakistan National Day event at the Pak embassy. The reason cited by the MEA was the invitation extended by the High Commission to the Kashmiri separatist leaders. "The decision was taken after Pakistan High Commission decided to call Hurriyat leader to the reception. In February we were very clear, any attempt by Pakistan High Commission or Pakistani leadership to engage with Hurriyat leaders will not be taken lightly," MEA spokesperson Raveesh Kumar had said.